Abstract: Now that the Athlon64 era is upon us you will soon be bombarded with all types of Athlon64 based peripherals. Now that the Athlon64 era is upon us you will soon be bombarded with all types of Athlon64 based peripherals. From motherboards to CPU coolers, a whole new market has just opened and there's a void of goodies at the moment. When it comes to motherboards, most manufacturers were ready to go public last year with their Athlon64 products, but due to AMD having manufacturing delays, no one could release their goods. After all how successful are you going to be at selling a motherboard when the processor's are not even available? VIA the manufacturer of the K8T800 chipset, is hoping that the K8 battleground is where they'll find redemption after falling from grace in the latter days of the AthlonXP (K7) arena. 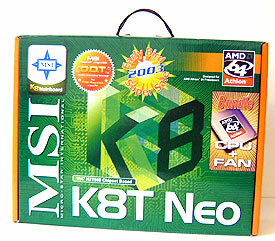 Today we're going to be testing a K8T800 based motherboard from the minds at MSI, called the K8T Neo-FIS2R. 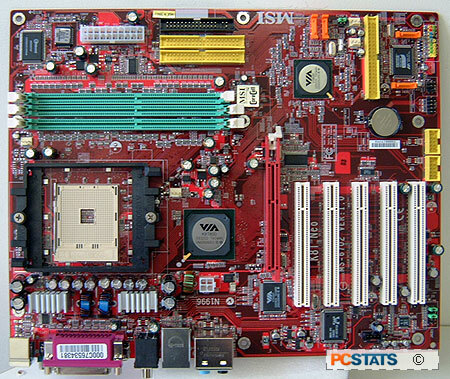 It's one of the first socket 754 Athlon64 motherboards on the market, and believe me, it's one heck of a package! The retail price of the board alone is going to be around $215 CDN ($160 US) but as you can see from the picture on the left, it can also be bundled with a socket 754 Athlon64 3200+ processor. The MSI K8T Neo-FIS2R with an Athlon64 3000+ will run about $620 CDN ($460 US), and if you want the faster Athlon64 3200+ model shown here it will cost about $910 CDN ($680 US). 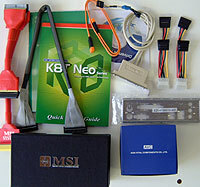 When shipped with a processor, the K8T Neo-FIS2R also includes a nice copper-base socket 754/940 AVC heatsink. MSI decided to go ahead with bundling processors with the motherboard because they were worried about the initial supply of Athlon64's. The brand-new 64-bit AMD processors are rumored to be in very tight supply until 2004, when AMD moves over to a 0.09 micron manufacturing process.